Those ingredients, combined with a skilled and agile fundraising team, led to an exciting multi-channel, “agile fundraising” campaign win that will ultimately send the University of Minnesota marching band to their first road game performance since 1996. 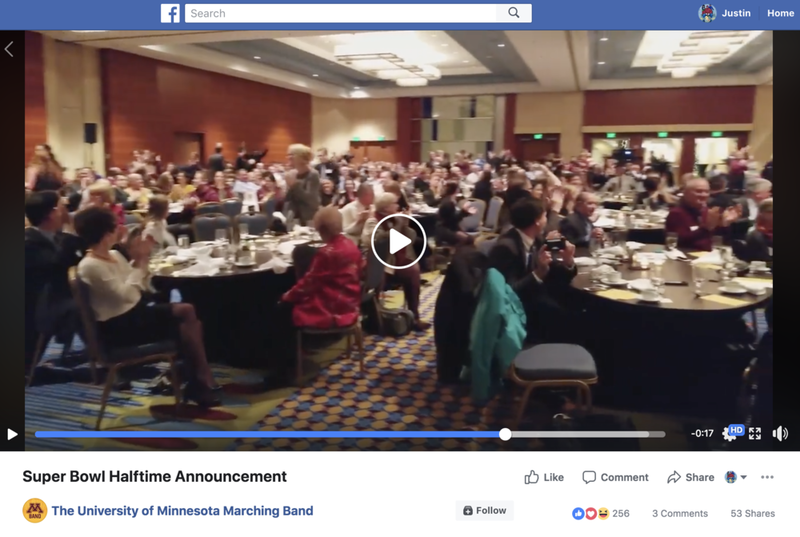 Click the image to watch a video of the University of Minnesota Marching Band learn they would be playing in the Super Bowl halftime show with Justin Timberlake. It starts with that closely trademarked “Big Game.” During this “Big Game” football event in Minneapolis, on February 4th, 2018 (wink, wink), Justin Timberlake invited the U of M’s Pride of Minnesota marching band to perform with him during the halftime show. The Pride of Minnesota knocked it out of the park with a flawless performance, and local news took notice. The University’s Foundation and it's College of Liberal Arts fundraiser, Jake Muszynski, saw the potential in advance. A small group within the Foundation had access to the privileged and secret information about a band half-time performance several days before the Big Game event. The skilled team of fundraisers, communicators, and strategists quickly turned to a generous band donor. Within days, the donor offered to match up to $100,000 to encourage an influx of donations to the band that could be used for travel with the football team for a B1G game. (Funding a road trip for the University of Minnesota Marching Band comes with a $100,000 price tag) In 2018, that game would take place in Lincoln, vs. the Nebraska Cornhuskers. The campaign was an instant success. Thousands of dollars were rolling in during the first few hours, with more than $20,000 raised in the first week. The fundraisers behind the project flexed their promotional muscle with a strong news media push, emails to supporters, social media marketing, and engagement of U of M social media influencers to drive the effort. Almost all of the marketing and fundraising was done online, with some gifts coming in-person and 10 percent of the final total raised through telemarketing. This communications work elevated the campaign and kept the momentum strong through the first $50,000+ raised. Then, a short stall – the fundraising stayed locked in the $50,000 range for the final weeks. The communications team fired up a video-based email and Facebook Ads campaign to drive toward the finish line. The final week total: $73,000+ raised by the April 6 deadline. Additional gifts trickled in after the “deadline” bringing the total to more than $83,000. "I had conversations with top donors leading up to the launch of this project, but the incredible thing about this campaign is that everything was organic. There were no gifts set up ahead of time--this campaign was truly built around excitement and timing, and it proved to be extremely successful," says Muszynski. The elements of the U of M Marching Band campaign were no coincidence. This approach of connecting with major gift capacity donors and working to magnify their generosity through donor-acquiring (and retaining) digital events was a very deliberate strategy on the part of the University of Minnesota Foundation. 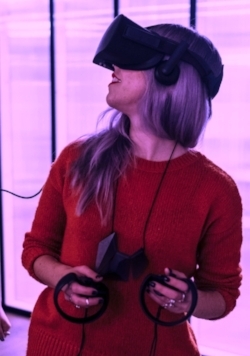 The Foundation’s team brought talented fundraisers and communicators together with forward-thinking strategy to connect digital-savvy large gift donors with online fundraising campaigns that aligned with the donors’ passions. Oreo Cookie was one of the first to introduce the concept of "agile marketing" during the Super Bowl in 2013. Agile marketing helped the U of M Foundation team find success, despite the tight-timeline. In less than a week, a CLA fundraiser had the generous matching gift of $100,000 ready to go. The communications team quickly followed with their email and social media strategies, the Big Game happened, the band performed, and now that same band is on its way to Lincoln for a long overdue B1G road game. In addition to funds raised, the project saw many other gains. "This project became a great cultivation tool, as donors told stories through their giving. Many donors left a note on the crowdfunding page saying who they were or why they were giving, and it made for a great way to follow up with those donors in a thank you," says Muszynski. "I was very surprised and excited at the number of new donors this project uncovered." Your fundraising organization can realize similar success to the University of Minnesota’s band campaign. Below are tips for launching and growing an agile fundraising program. From video, to digital for major gifts, to email, to online ambassadors, and more - Groundwork Digital builds programs that produce results like the UMN Marching Band campaign. Click here to fill out our contact form and we'll be in touch soon with how we can help. Justin Ware is the Co-Founder and President of Groundwork Digital. A thought-leader in the nonprofit sector, Justin is a fundraising and content marketing expert. Justin's work spans nonprofits, higher education, and media. In 2009, Justin was the executive producer on one of the first ever YouTube videos to win an Emmy. The "Science of Watchmen" video has been viewed nearly 2 million times and was also nominated for a Webby. Justin began his career in television before joining the University of Minnesota and then Bentz Whaley Flesser. After BWF, Justin led digital fundraising strategy at Ruffalo Noel Levitz as well as Product Management for Annual Giving. Justin has spoken at numerous conferences, and led consulting engagements for universities and nonprofits across the country. In his spare time, Justin can be found rooting for the Minnesota Vikings and Gophers, skiing, hiking with his dog, and enjoying family time with his wife and two children. Justin would love to talk digital fundraising from giving days to the major gifts program. Email him at justin@groundworkdigital.com.